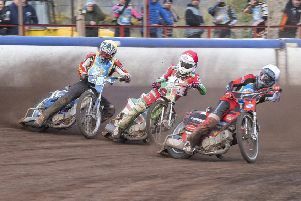 By common consent Peterborough Panthers fully merited the match point they gained against Edinburgh Monarchs in their Championship league clash at Armadale last Friday. However, Monarchs team manager Alex Harkess was the exception feeling the Panthers were “very lucky” to leave with a point. As Monarchs head to the East of England Showground for the return match on Sunday, Harkess insisted: “It wasn’t a point lost to us because we got the three points we wanted. They got a point they probably did not deserve because we let them back into the match. Without doubt the true star of Peterborough’s closely fought battle with the Capital side was the outstanding performance of Scott Nicholls who made only his second appearance at the Lothian Arena in 20 years and amassed paid 18 points from seven outings including a brilliant victory in heat 13 over Monarchs’ top duo of Erik Riss and Ricky Wells. Harkess said: “It did not make much difference. Nicholls has been around long enough and our track held no problems for him. “He kept Peterborough in with a chance because he was given seven rides. And because of certain concerns over the make-up of the Peterborough team, he kept them in the hunt – but they were still lucky to get a point. Harkess revealed his skipper Erik Riss was plagued by certain machine problems which explained the German’s failure to win a race. “Erik couldn’t get his bike to go, it was flat. He spent half the meeting thinking it was his carburetor to blame but it turned out to be something else. “It’s sorted now and I’ll be surprised if it happens again. One thing did make Harkess relatively happpy and that was the display of Joel Andersson. The Swede scored six points, including winning heat eight with partner Josh Pickering. Harkess feels Monarchs are in with a real chance of pinching something from Peterborough on Sunday. “We will be going there with the same attitude Peterborough brought to our place a week ago. Meanwhile, Armadale stages the Scottish Open Championship (7.15pm) this evening sponsored by Harrisons Ford Centre. And if supporters are looking for a home win then Wells or Erik Riss may deliver the silverware. Previous winners Rory Schein and Sam Masters, who triumphed in 2014, are among the 16-man field and may pose the biggest threat.